Is 'norture' better? That gets it pretty close to torture, though, but which I suppose is potentially accurate for some people. 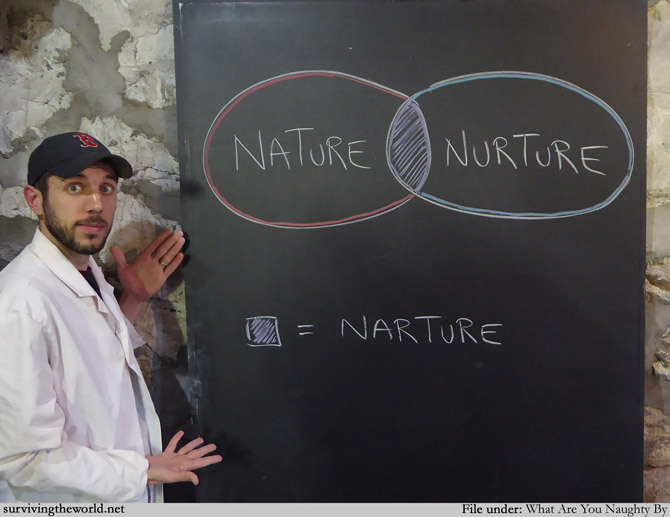 Fun fact: "nature nurture" is an anagram for "untrue an' truer", whatever that tells you. If you wanted the anagram of "nature vs nuture", then it becomes "untrue truer vans", and that's just not interesting to begin with. "Surviving the World" is an anagram for "Lewd survivor thing" which maybe suggests you shouldn't be reading my comic.